A general neurologist with specialty training in neuromuscular diseases, Dr. Dousmanis is board-certified in general neurology and in electrodiagnostic medicine. He treats patients will all manner of neurologic problems, such as: stroke, tumor, multiple sclerosis, dementia, migraines, back pain, sciatica, seizures, and parkinsonism. His specialty interests include peripheral nerve and muscle diseases, motor neuron diseases, and nerve injury. Dr. Dousmanis is a member of the American Academy of Neurology and the American Association of Neuromuscular and Electro diagnostic Medicine. He is the author of numerous peer-reviewed publications. Dr. Dousmanis received his Ph.D. in cell biology from Rockefeller University and his M.D. degree from Cornell University Medical College. He completed his neurology residency at the Neurological Institute of Columbia University at New York-Presbyterian Hospital. 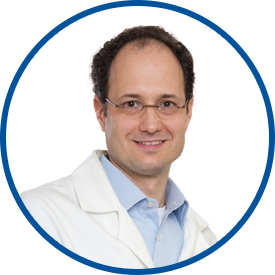 He is an attending physician at Lawrence Hospital and at New York-Presbyterian Hospital, and is an assistant clinical professor of neurology at the Columbia University College of Physicians and Surgeons. Athanasios G. Dousmanis joined Neurologic Consultants of Westchester in 2005, and became partner in 2008. He joined Westmed Medical Group in October 2010. I already recommended Dr. Dousmanis to colleague. She was very pleased with her experience too. I have been to *Dr. Dousmanis before - he thinks out of the box and is most observant! He is smart and knows the symptoms, and makes practical conclusions. Dr. Dousmanis makes me feel like I have agency in my health care decisions while making me feel comfortable and hopeful. Couldn't ask for a better team. Dr. Dousmanis is excellent. He is knowledgeable, competent, and willing to listen to complaints and care suggestions. He does not minimize my experience with medications and refusal to accept some medication recommendations.